I attempt it, however, and I query, too, some of the assumptions, as they have tacit “sub-assumptions” that do not survive scrutiny. These appear to be Euclidean notions, carried over and then misapplied. I have underlined the statements with which I would take issue. Many of the notions presented here are counter-intuitive, and may seem to confound “common sense”. But common sense is more of a semi-conscious compilation of utilitarian rules-of-thumb than it is an index to fact. For example, common sense says that parallels can't meet, but simple logic says they must. The deeper problem is not whether parallels meet, but whether they exist at all. because none is by itself a calibrated interval [ * ]. It follows that no element is a quantity, so each must therefore be a quality. A point, for example, is just a place, a “somewhere”. Place is its quality. A place is not an interval, so has no size - not even zero. So a point is not “undefined”: it is defined as place. by definition, ‘elements’ are not composite (they are, in fact, atomic – that is to say, uncuttable. They cannot be broken, and cannot have parts). To say an element consists, or is composed, of anything, is a contradiction, and a serious logical error. Anything that 'consists' of something else is simply not an element. qualities are not the quantities they would need to be in order to be summed, stacked, or aggregated (integrated) into something else—into a line, say, or a plane—as per Mr Faulkner's assumptions. Now, the integral calculus deploys such “infinite summation” of (the orthogonal components of) “infinitesimals”. Infinitesimals are absolute, calibrated intervals that must stop just short of zero, because not even an ∞∞ of zeroes will sum to a non-zero value. 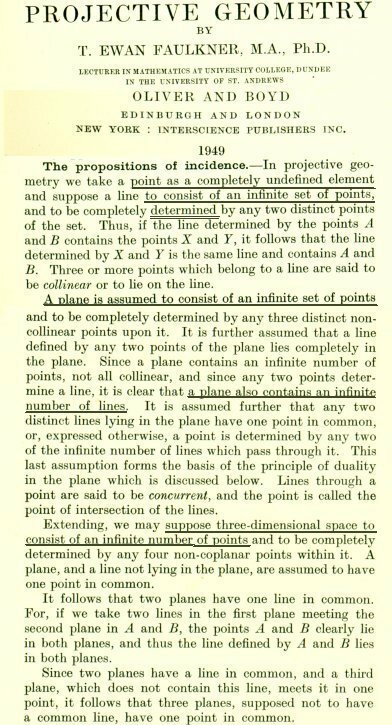 No doubt, if points were infinitesimals, they could be summed into lines or planes, so that these elements would ‘consist’ of them – but points are not infinitesimals. Such “Euclideo-Newtonian” concepts are commonly, but wrongly, tacit in treatments such as Faulkner's of the elements. * An interval requires two elements of the same type spanned (linked) by an element of another (appropriate) type, so every simple interval always involves three elements. two planes must be linked by a line. In other words, projective intervals must have valid conditions of incidence. Iff such intervals can be conflated with number (metricised) such that distinct intervals can be made absolutely equal (unitised/calibrated), and if such intervals can be summed, then serially contiguous intervals of type 1, in the list above, sum to distance, and those of type 2 sum to angle. We see that the calibrated interval between two planes in a line is not an angle, because an angle is the calibrated interval between two lines in a point (type 2 above), so serially contiguous intervals of type 4 sum to what might be termed "turn" or, perhaps, "swing".